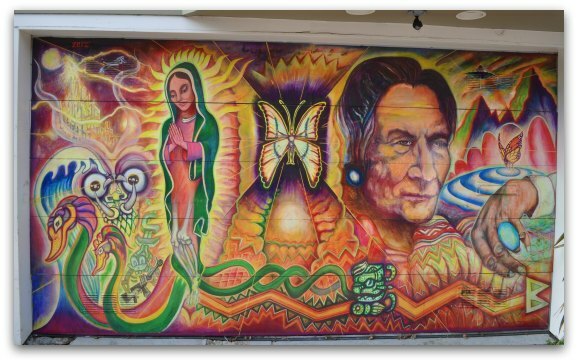 The Mission District murals are famous for their colorfulness and variety. They are spread out all over the Mission District in San Francisco and something you have to see when you visit. 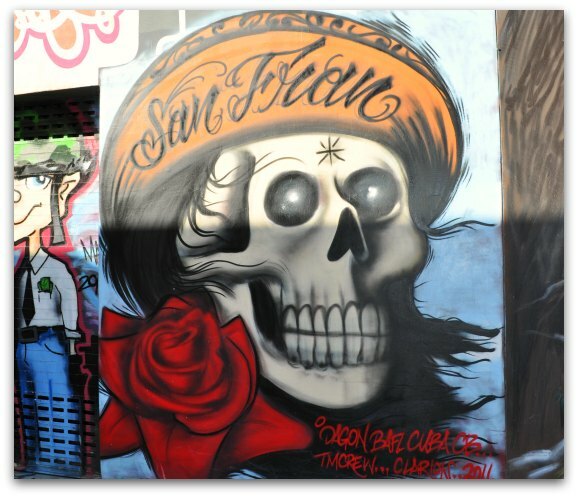 San Francisco has more than 1,000 murals throughout the city. However, the largest concentration of them is in this SF neighborhood. You will find painted pieces, mosaics and a few that combine both styles. You can also find a handful with some 3D elements. 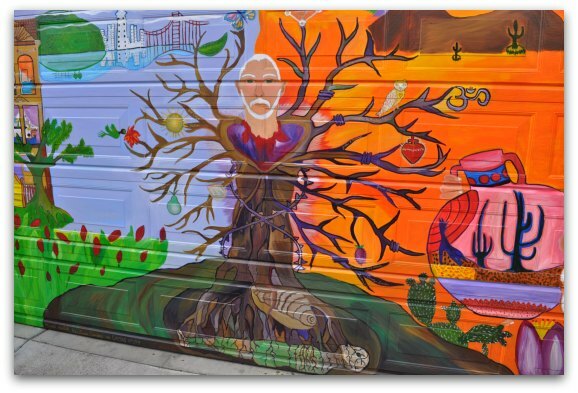 Although they may seem random, a lot of hard work goes into managing the Mission District murals. Precita Eyes is the non-profit organization that links artists with requests. 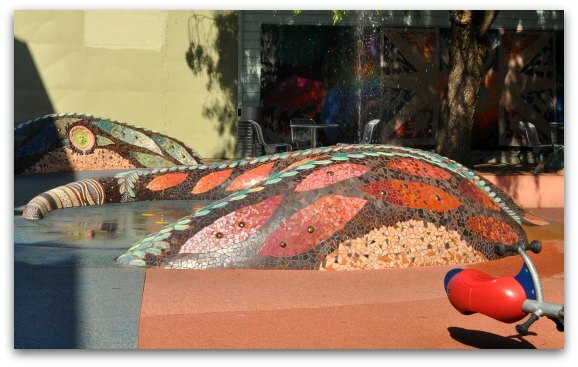 Both public and private businesses and individuals request them to spice up the outside of their buildings. You will see them on churches, restaurants and even schools. They are in parks and even on the garage doors of private residences. 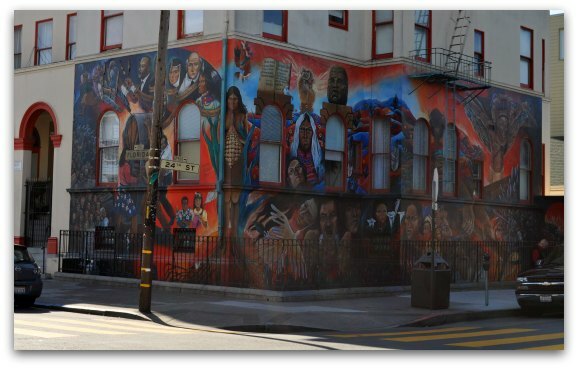 While many of these San Francisco murals are in great shape, you will see some peeling or fading away. Others become ruined when garage doors break or someone backs into them. Some of the earliest ones date back to the 1970s, so both time and weather have impacted them. On this page, you get to see some of these beautiful pieces of art. They come in all different shapes, sizes and colors, but each one is tells a story and is a unique work of art. Below, you will find information on how to find some of them. You will also find recommendations for walking tours so you can learn even more about each one. 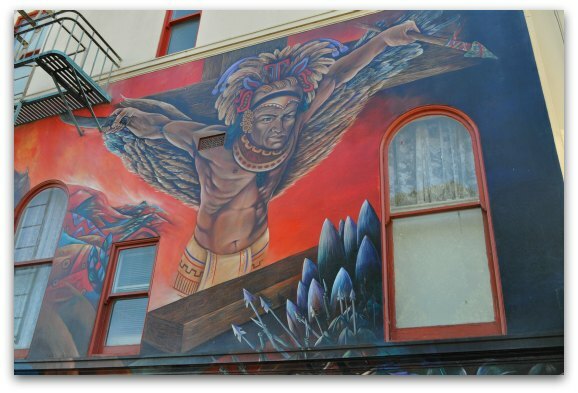 Balmy Street is the first of two streets with a large concentration of Mission District murals. This is also where it all started. The first artist painted one on the back of a building on this street in the early 1970s. Now, the street has one on almost every back fence or garage door. This is a political mural on the back of an old shed. At the top, you can see the shed itself is in need of repair, but the mural is in great shape. This is another one of the older works. 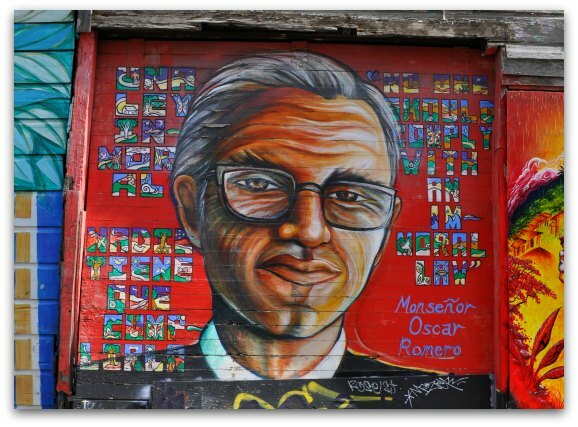 It is a portrait in honor of the Archbishop of San Salvador, Monsenor Oscar Romero. He was assassinated in 1980 after speaking out against the violence in the country. He asked the Salvadorian soldiers to stop carrying out acts of violence against the people in the community. 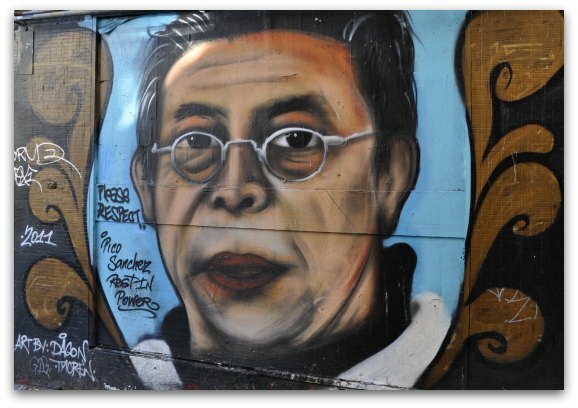 He is considered a martyr for his bravery and speaking out against the violence brought on by the government. 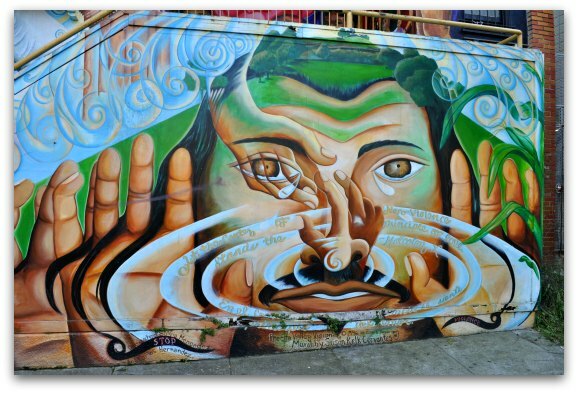 This is an example of the new Mission District murals. The artist just unveiled it in February 2012. It celebrates the life of Father Richard, who was an advocate for AIDS awareness and those suffering from the disease. He lost his brother to AIDS and from then on, dedicated his life to helping others. 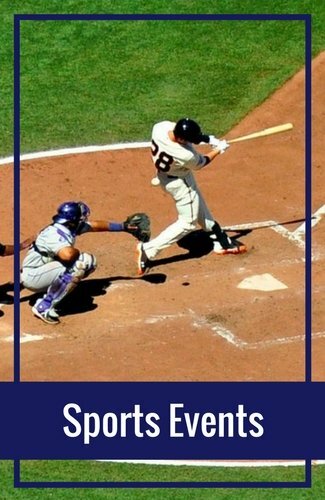 He was then diagnosed with ALS or Lou Gehrig's disease. He suffered from ALS for five years before losing his battle in August 2011. This is a powerful piece with a lot of detail and color. It's a great memorial for Father Richard. Even though it is only one block long, these are three other beautiful murals on Balmy Street. 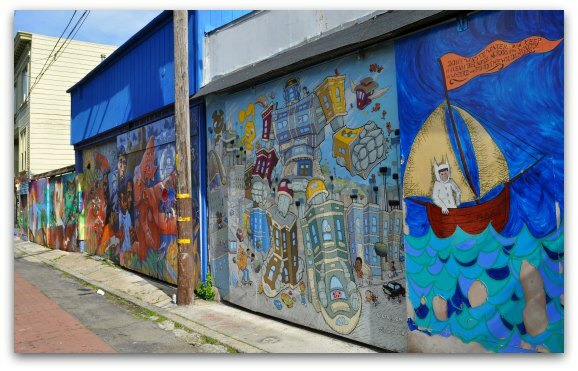 These Mission District murals showcase the diversity of the art in this alley. 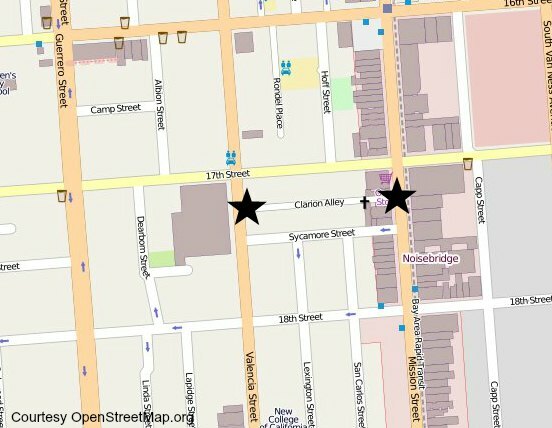 You can find it between 24th Street and 25th Street. 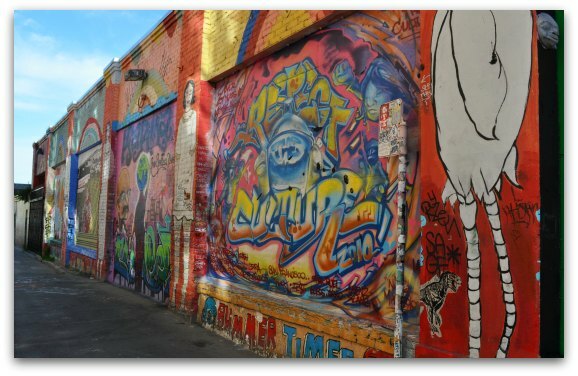 Another street filled with murals is Clarion Alley. 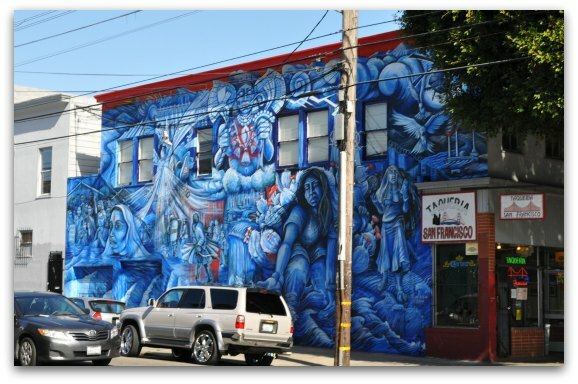 This is a little further north and also has a number of colorful Mission District murals. This is a view down Clarion Alley. You can see the number of murals lined up side by side down the entire block. 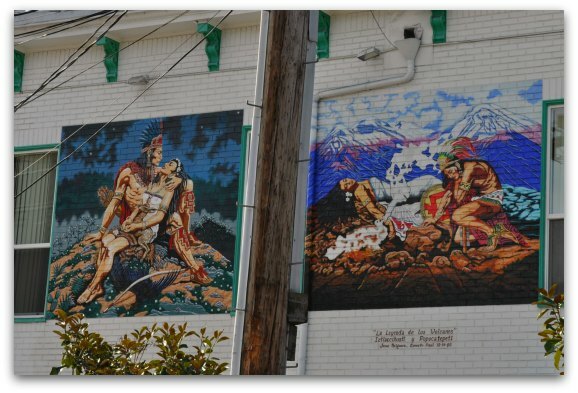 This shows you more murals side by side on the street. These are all on the back of garage doors to private residences. 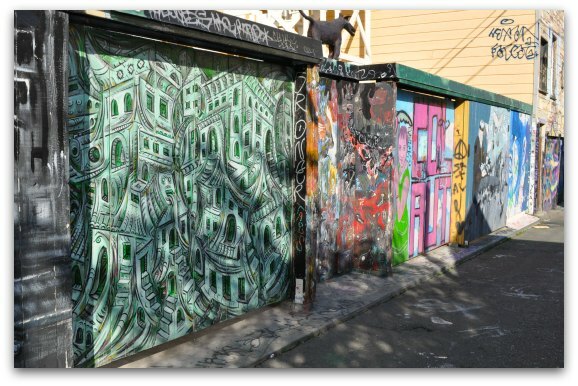 You can find these murals in Clarion Alley between Mission Street and Valencia Street. 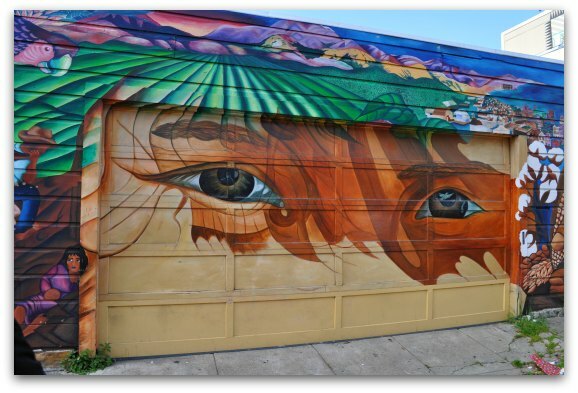 In addition to the concentration of Mission District murals in the two streets mentioned above, you will find a number of colorful murals throughout this San Francisco neighborhood. 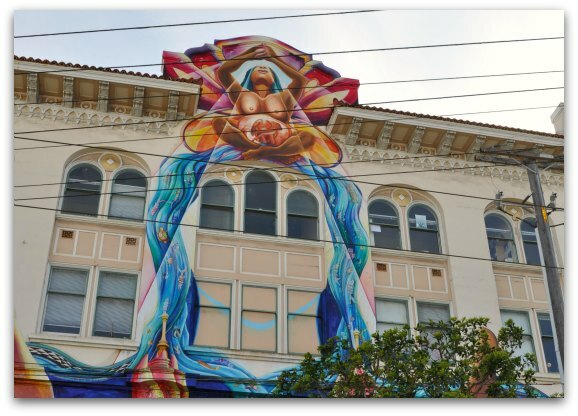 These two murals are on the Women's Building on 18th Street between Valencia and Guerrero Streets. The first one is a view of the entire building with murals on both the North and East sides. The second photo is just a portion of the mural above the main entrance. 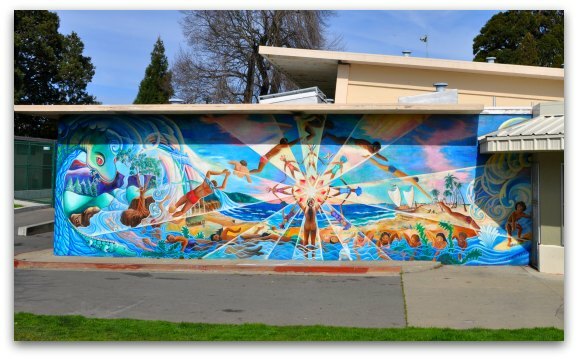 These two large murals are on the walls of Flynn Elementary School. 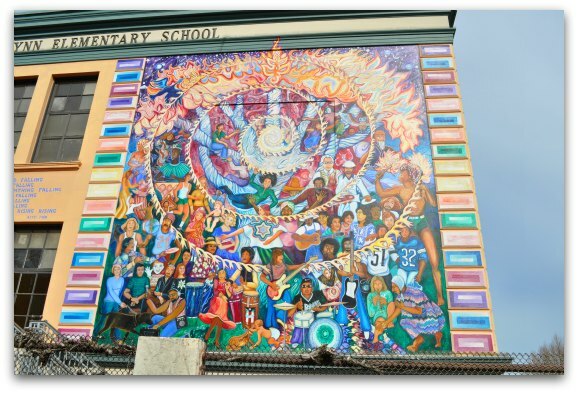 The school has a number of Mission District murals and these are two of the largest. The top one is "Family Life" and bottom one is "The Spirit of Mankind". Both are on the southern side of the school at Precita and Harrison Street. When you visit, make sure you walk entirely around the school, as there are several other murals on the other sides. 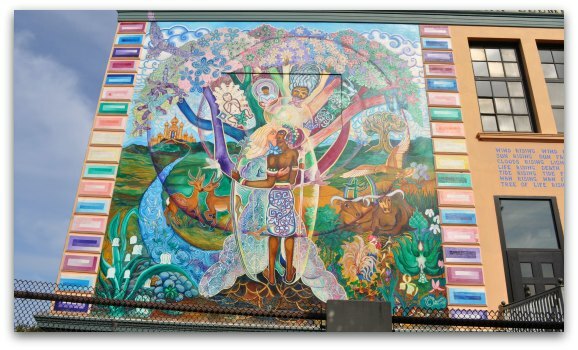 This beautiful San Francisco mural is on the Precita Community Center at Precita and Harrison Street. It is about a block from the Flynn Elementary School. This one has a touching background. It is the story of the community, but is also about two youngsters killed in the park next door. It is a statement against violence and a memorial to the two youngsters killed more than 30 years ago. The two pictures above are on the side of the swimming pool at Garfield Square. Originally, it was just one full piece, but was cut in half with the addition of a larger entry way into the pool. The name of it is "The Primal Sea" and was painted in 1980. As you can see, these are constantly changing based on the circumstances around them. The two murals above are on St. Peter's Catholic Church on the corner of Florida Street and 24th Street. The first one shows the complete one on the north and east sides of the building. The second one is a close up of the intricate details of just part of the overall work. 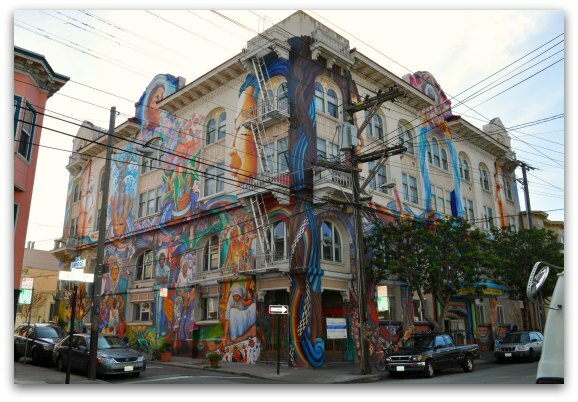 The three Mission District murals above are on the eastern side of a building on the corner of 24th Street and Alabama Street. 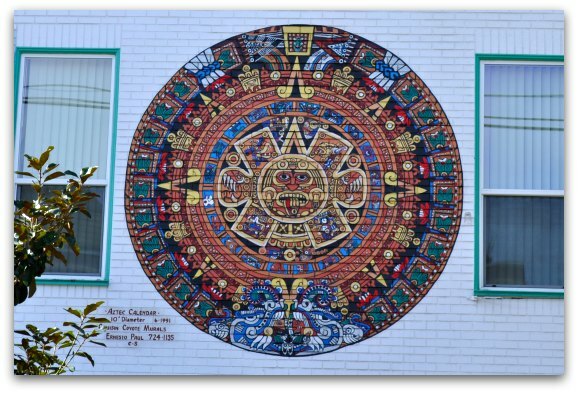 The first circle is the Aztec Calendar. The other two in the second photo are just to the south of the first one. The detailed art work above is on 24th and York Streets. 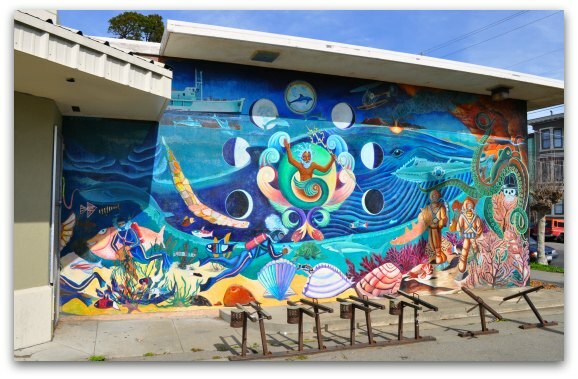 The original idea for this murals was based on the story of a woman that pushed her kids into the San Francisco Bay. This happened several years ago. The story is centered in the middle of the mural with other stories surrounding it. 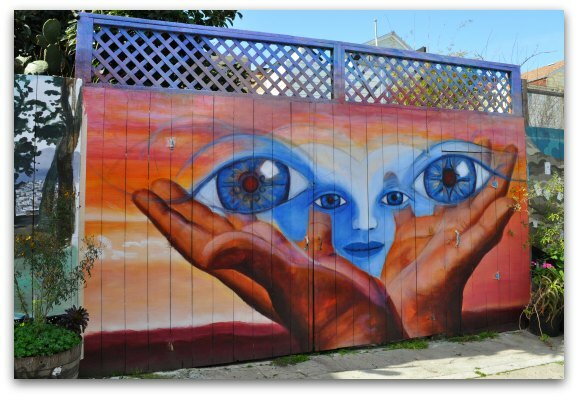 The mini-park on 24th and York Streets has several Mission District murals. Both the eastern and western side of the buildings along the park are colorfully decorated. 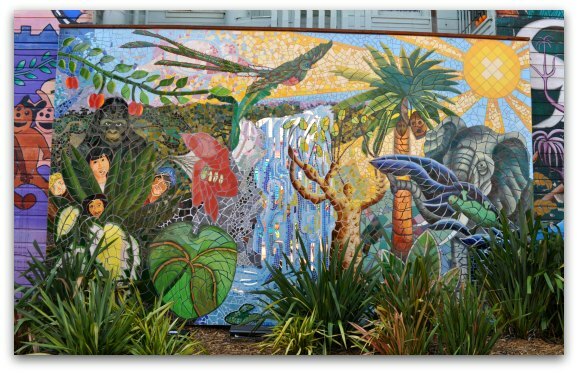 The first picture shows a mosaic with mirrors and other pieces pulled together to create this jungle theme. The picture on the bottom is also a mosaic on a fountain. Kids coming to the park can hit the button on the fountain and run through the water to cool off on hot days. This final picture shows the front of two buildings on 24th near St. Peter's Church on Florida Street. 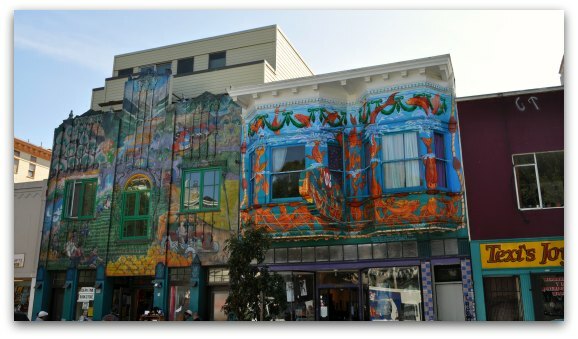 San Francisco Art Museums: If you are a fan of art, San Francisco has some of the best art museums in the country. You can find everything from modern art to historical pieces. 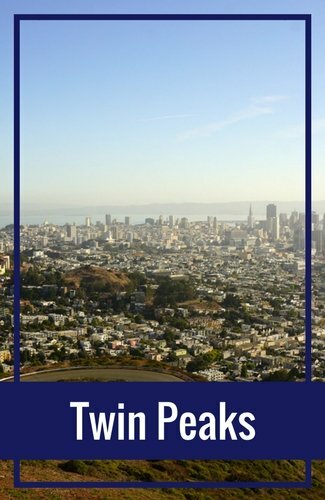 Read on to learn more about visiting one of the San Francisco art museums, their current and upcoming exhibits, how to save money on your visit and more. 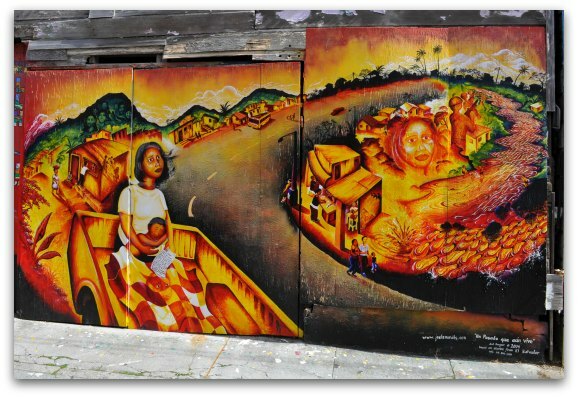 The best way to learn more about the Mission District murals is through a walking tour. 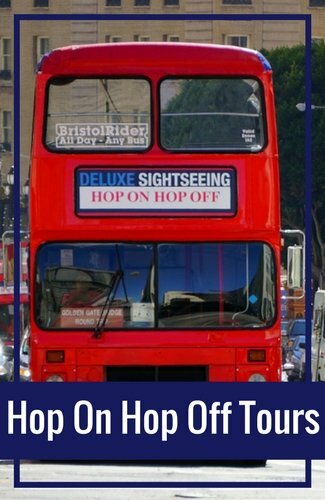 There are two organizations that provide walking tours. 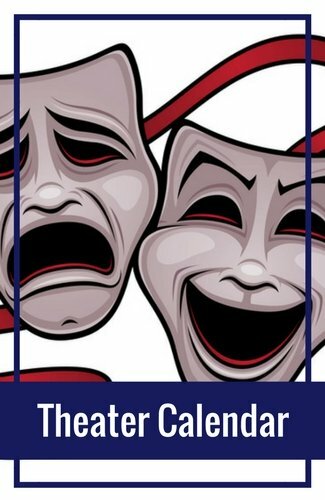 Public Library Walking Tours: The public library offers two free walking tours in this district. Each one is about two hours long. The first is around the pieces in the southern part of the district and starts at Flynn Elementary School. This one takes you through Balmy Street also. The second showcases those on the northern side of the Mission. It starts at the Women's Center Building. 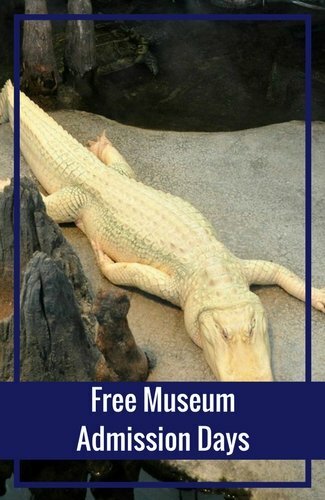 Read on to learn more about these and other walking tours through the public library. Precita Eyes: If you want to learn more about these, then you should look at the walking and biking tours offered by Precita Eyes. 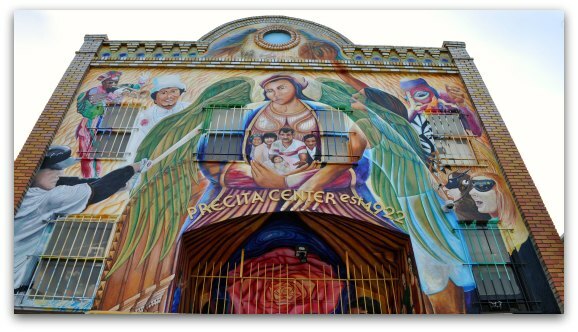 This is a non-profit organization that manages the Mission District murals. 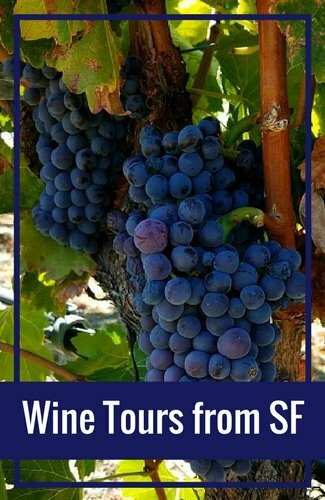 They have a few different tour options and prices start at $15 for adults. Learn more about the Precita Eyes tours. 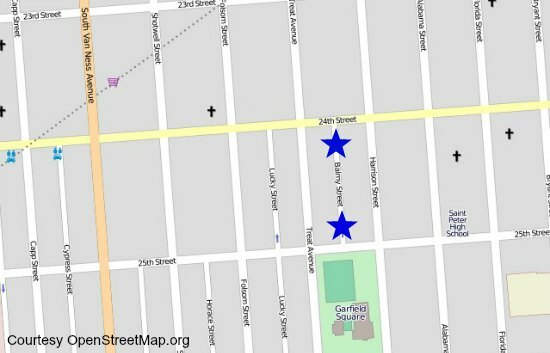 Hotels in Union Square: Union Square is in the city center and a popular place for people to stay. Whether you are looking for a five star or two star hotel, you can find them all here. Read on to find a list of recommendations for every budget. Fishermans Wharf Hotels: The other popular place to stay is in Fishermans Wharf. It is on the northern side of the city and close to Pier 39, the Alcatraz ferry and other attractions in the area. Discover some of the best hotels for you in Fisherman's Wharf. Discounts & Deals: Are you interested in saving a little money on your trip? Check out some of the great deals on the San Francisco discounts page. 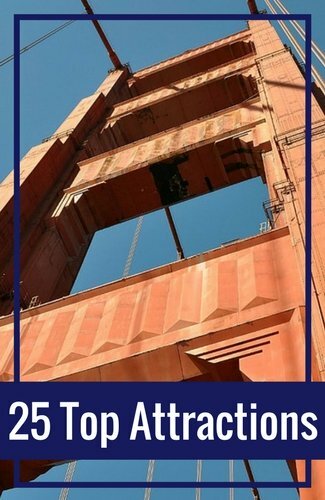 Find tips for saving money on your hotels, flights and some of the San Francisco attractions.